Modular Mains Powered Desk Mount Indicator, Setpoint Configuration. This is the PT600R Setpoint Configuration consisting of the PT600R Modular Indicator, Back Shell & Desk Stand, 8 I/O Setpoint Module and AC Power Supply Module. Depending upon its configuration the PT600R is ideal for the following applications: Weighbridges,Platforms,Counting,Totalizing,Material Testing,Batching,Grading. Manual for general operation of PT600R indicator. Manual for setup and installation of PT600R indicator. 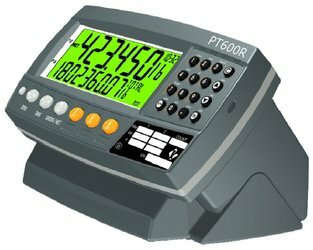 Reference manual for PT600R indicator. Free software to remotely configure and display weights on a Windows PC from the PT600R indicator. Revisions for PT600R Manual for version 4 software.